It’s the last hurrah for the Fort Lewis College graduating senior art majors. In their final exhibit – now on display at the college art gallery – students not only selected the art to display, they worked with gallery director Rita Cordalis to hang and light the exhibit. It is satisfying to see several of the soon-to-be graduates pushing boundaries and creating art that is different from what most viewers experience in Durango. Even without access to art museums, the faculty is managing to expose their students to the wide range of art being made today and more importantly, encouraging these young artists to find their own truthful form of expression beyond mimicry and imitation. “Baby Girl,” colored pencil, is one of three in the Watermelon Portrait Series by Ebony Ice. Ice is a graduating senior at Fort Lewis College. 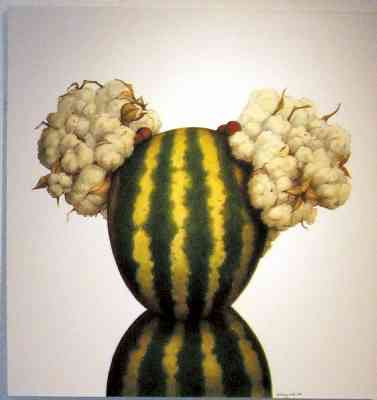 The absurdity of racial prejudice is explored in the highly detailed, exquisite, colored-pencil drawings of Ebony Ice. Ice says in her artist statement that her future plans include character design for animated films. Perhaps she might want to remake herself as the female version of Takashi Murakami, the artist who seeks to blur the lines between fine and commercial art, or take a stab at creating her uncomfortable yet humorous images as larger-than-life cartoon characters a la Jeff Koons and his giant, blow-up puppy. Ice has the makings of being a far better artist than Koons or Murakami. Her drawings and illustrations are competent for a college senior, and her sensibility is much deeper than that of most college students. I don’t know if Ice is a nontraditional student (someone outside typical college age) or a twenty-something. She calls the three drawings her “Watermelon Revolution,” saying she has always been impressed by those with the integrity to stand up for what they believe. Apayo Moore is another whose art is created with a mission in mind: protecting the wild salmon of Bristol Bay. A native Alaskan, Moore provides a humorous look at salmon in her diptych “B.B. (Bristol Bay) Red” and “B.B. (Bristol Bay) King.” “B.B. King” is of a salmon playing the blues. Maybe Moore should send her paintings to the governor of her home state. 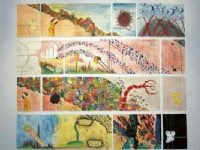 “Things Fall Apart (The Epic of Dardanus)” a 13-panel installation by Chandler Wigton at the Fort Lewis College Art Gallery is part of the Senior Art Exhibit on display through Dec. 18. Chandler Wigton makes a large statement with his 13-drawing installation on the back wall of the gallery titled “Things Fall Apart (The Epic of Dardanus).” The drawings are all the same height but vary in width, and the artist uses multiple media to create his work, such as ink, graphite, oil, watercolor and acrylic paint. It’s a narrative work that tells a fragmented story with images and text. “In my art, I want to express the utter and inevitable sense of despair, sadness, loss and hurt that comes along with being a living organism on this planet while simultaneously interlacing my imagery with messages of hope, healing, love and rebirth,” he writes in his artist statement. The exhibit is heavy on drawing, painting and ceramic work. There are two photographs and one large sculpture on display. Digital media is more prevalent than in earlier senior student exhibits. Some of these artists will continue to pursue creative work, others likely will not. Either way, these students understand a bit more about what it means to make art and then to display it, market it and try to sell it.